On May 15, 2017 is expected to mount the largest bronze bell in Europe, right in Cathedral of the Cheated Nation, near Cathedral of Nation’s Thieves, another monstrous mega construction in Bucharest. Romanian Orthodox Church exceeded my expectations. 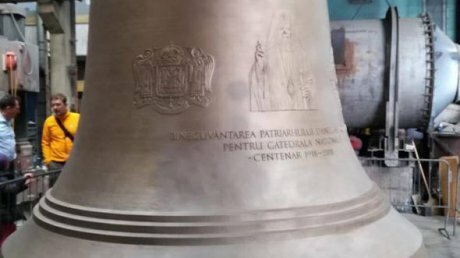 I suspected that an institution so greedy will be able to fulfill the dream of a leader haughty lifting a useless construction with devil’s tools: theft, blackmail and lies, but I never imagined that The One who took possession of the Romanian Orthodoxe Church will be so petty as to impress his face on the largest bronze bell from Europe.